Void outside the 50 United States, District of Columbia and where prohibited. Do not proceed to enter if you are not at least 21 years of age and a legal resident of, and located within, one of the 50 United States, or the District of Columbia, at the time of entry. By participating, you agree to be bound by these Official Rules and the decisions of the Sponsor, which are binding and final in all matters relating to this sweepstakes. 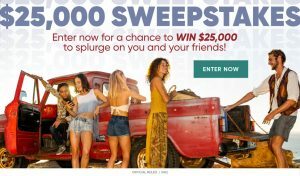 Sweepstakes is offered by Meredith Corporation and may be promoted by any of Meredith’s publications in various creative executions online and in print at any time during the sweepstakes. 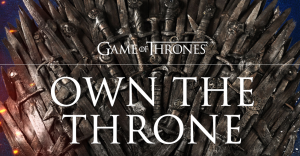 Note that the Websites referenced within these Official Rules may not be the full list of websites (i.e., specific URLs) used to promote this Sweepstakes. 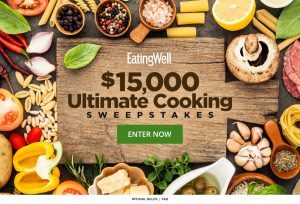 If the promotional ad you see in a magazine, or website or hyperlink that you follow online to enter this Sweepstakes refers to these Official Rules, such website is considered a “Website” under this promotion. 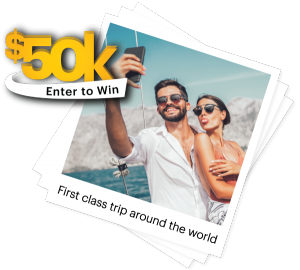 SWEEPSTAKES PERIOD: The $10,000 Sweepstakes (“Sweepstakes”) begins at 12:01 a.m. Central Time (“CT”) on 7/1/18 and ends at 11:59 p.m. CT on 9/30/18 (“Sweepstakes Period”). HOW TO ENTER: During the Sweepstakes Period, visit www.bhg.com/10ksummer, www.parents.com/10ksummer, www.fitnessmagazine.com/10ksummer, www.shape.com/10ksummer, www.marthastewart.com/10ksummer, www.marthastewartweddings.com/10ksummer, www.allrecipes.com/10ksummer and www.eatingwell.com/10ksummer. (each, a “Website”) and follow the instructions provided to submit a completed online entry form to receive one (1) entry. There is no cost to register or enter. Entering the Sweepstakes will automatically register entrant at www.bhg.com, www.parents.com, www.fitnessmagazine.com, www.shape.com, www.marthastewart.com, www.marthastewartweddings.com, www.allrecipes.com, and www.eatingwell.com if entrant has not already registered. Entries generated by script, macro or other automated means or practices, or by any means which subvert the entry process will be void. All entries must be submitted by 11:59 p.m. CT on 9/30/18 to be eligible. All entries become the property of Sponsor and will not be returned. Sponsor reserves the right, in its sole discretion, to: (i) verify any element of any entry, related materials or entrant’s eligibility; (ii) to request additional information; and (iii) to disqualify any entrant whose participation may subject the Sweepstakes, Sponsor or Sponsor’s advertisers, clients, or customers to controversy, negative publicity, scorn, or ridicule. 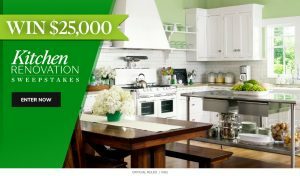 By entering this Sweepstakes, you agree to provide any documentation or information deemed necessary by, and in a form acceptable to, Sponsor to satisfy the above requirement if asked by Sponsor to do so. 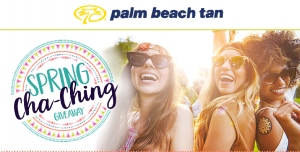 LIMIT: There is no limit to the number of entries each individual can receive throughout the Sweepstakes Period, however you may only use one (1) email address to enter this Sweepstakes. Each entry form submitted will result in one (1) entry. 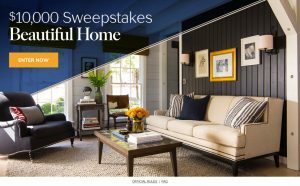 ELIGIBILITY: This Sweepstakes is open to legal residents of the 50 United States and the District of Columbia, 21 years of age or older. Employees of Sponsor and any other organizations affiliated with the sponsorship, fulfillment, administration, prize support, advertisement or promotion of the Sweepstakes and each of their respective parents, agents, affiliates, subsidiaries, and advertising and promotion agencies, and their immediate family members (regardless of where they reside) or household members, whether or not related, are not eligible to enter or win. “Immediate family members” shall mean spouses, parents, step-parents, children, step-children, siblings, step-siblings, and their respective spouses. “Household members” shall mean people who share the same residence at least three months a year. 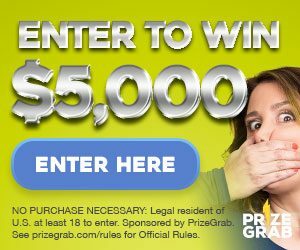 WINNER SELECTION/DRAWING: On or about 10/8/18, Sponsor will conduct a random drawing from among all eligible entries received and combined from all Websites throughout the Sweepstakes Period to select one (1) potential winner. Odds of winning depend upon the number of eligible entries received. WINNER NOTIFICATION: Potential winner will be notified via email and/or mail and will be required to complete and return an Affidavit of Eligibility, IRS W9 form, and Release of Liability/Publicity within ten (10) days of date of notification or an alternate winner may be selected in a random drawing from among all remaining eligible entries. If such documents are not returned within the specified time period, prize or prize notification is returned as undeliverable, Sponsor is unable to contact potential winner or potential winner is not in compliance with these Official Rules, prize will be forfeited and, at Sponsor’s discretion, an alternate winner may be selected. PRIZE (1): A $10,000 check made out to the winner; Approximate Retail Value (“ARV”): $10,000. Winner may not substitute, assign or transfer prize, but Sponsor reserves the right, at its sole discretion, to substitute prize (or portion thereof) with one of comparable or greater value. Winner is responsible for all applicable federal, state and local taxes, if any, as well as any other costs and expenses associated with prize acceptance and use not specified herein as being provided. All prize details are at Sponsor’s sole discretion. ARBITRATION: Except where prohibited by law, as a condition of participating in this Sweepstakes, entrant agrees that: (1) any and all disputes, claims, and causes of action arising out of or connected with this Sweepstakes, or the prize awarded, shall be resolved individually, without resort to any form of class action; and exclusively by final and binding arbitration under the rules of the American Arbitration Association and held at a AAA regional office in New York, NY; (2) the Federal Arbitration Act shall govern the interpretation, enforcement and all proceedings at such arbitration; and (3) judgment upon such arbitration award may be entered in any court having jurisdiction. Under no circumstances will entrant be permitted to obtain awards for, and entrant hereby waives all rights to claim punitive, incidental or consequential damages including attorney’s fees or any other damages, other than for entrant’s actual out-of-pocket expenses (i.e., costs associated with participating in this Sweepstakes), and entrant further waives all rights to have damages multiplied or increased. RELEASES: By participating in this Sweepstakes, entrants agree to release Sponsor and any other organizations affiliated with the sponsorship, fulfillment, administration, prize support, advertisement or promotion of the Sweepstakes and each of their respective parents, agents, affiliates, subsidiaries, advertising and promotion agencies, and prize suppliers, and each of their respective officers, directors, agents, representatives and employees, as well as each of their respective successors, representatives and assigns (collectively, the “Released Parties”) from any and all actions, claims, injury, loss or damage arising in any manner, in whole or in part, directly or indirectly, from participation in this Sweepstakes and/or acceptance, use or misuse of the prize. OTHER: Released Parties are not responsible for lost, late, incomplete, damaged, inaccurate, stolen, undelivered, garbled or misdirected entries or registrations; or for lost, interrupted or unavailable network, server, Internet Service Provider (ISP), website, or other connections, availability or accessibility or miscommunications or failed computer, satellite, telephone or cable transmissions, lines, or technical failure or jumbled, scrambled, delayed or misdirected transmissions or computer hardware or software malfunctions, failures or difficulties, or other errors or difficulties of any kind whether human, mechanical, electronic, computer, network, typographical, printing or otherwise relating to or in connection with the Sweepstakes, including, without limitation, errors or difficulties which may occur in connection with the administration of the Sweepstakes, the processing of entries, the announcement of the prize, or in any Sweepstakes-related materials. Released Parties are also not responsible for any incorrect or inaccurate information, whether caused by site users, tampering, hacking or by any equipment or programming associated with or utilized in the Sweepstakes. 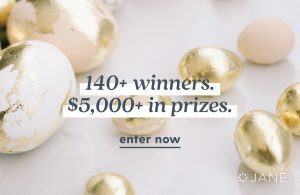 Released Parties are not responsible for injury or damage to entrants’ or to any other person’s computer related to or resulting from participating in this Sweepstakes or downloading materials from or use of the website. Sponsor reserves the right, in its sole discretion to disqualify any person tampering with the entry process, the operation of the web site or otherwise in violation of these Official Rules. 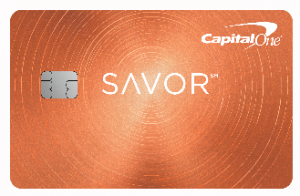 Sponsor further reserves the right, in its sole discretion, to cancel, terminate or modify this Sweepstakes if the Sweepstakes is compromised by virus, technical corruption, non-authorized human intervention, or any other causes which, in the sole discretion of the Sponsor, corrupt or affect the administration, security, fairness, proper play or integrity of the Sweepstakes. In the event of cancellation or termination, Sponsor reserves the right to select the potential winner in a random drawing from among all eligible, non-suspect entries received and combined prior to date of cancellation or termination. In the event of a dispute regarding online entry, entry will be deemed made by the authorized account holder of the e-mail account associated with the entry and he/she must comply with these Official Rules. The authorized account holder is the natural person who is assigned the e-mail address by the Internet Service Provider (ISP), on-line service provider, or other organization responsible for assigning email addresses. 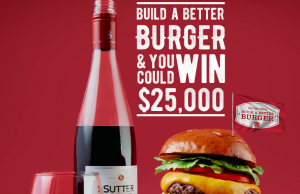 CAUTION: ANY ATTEMPT TO DELIBERATELY DAMAGE THE WEBSITE OR UNDERMINE THE LEGITIMATE OPERATION OF THIS SWEEPSTAKES IS A VIOLATION OF CRIMINAL AND CIVIL LAWS, AND SHOULD SUCH AN ATTEMPT BE MADE, SPONSOR WILL DISQUALIFY ANY SUCH INDIVIDUAL AND RESERVES THE RIGHT TO SEEK DAMAGES (INCLUDING ATTORNEYS’ FEES) AND OTHER REMEDIES FROM ANY SUCH INDIVIDUAL TO THE FULLEST EXTENT PERMITTED BY LAW. Except where prohibited by law, entry constitutes permission to use each entrant’s name, hometown (city and state), voice, biographical information, likeness, photograph and any statements regarding this Sweepstakes in all media now known or hereafter discovered, for any purpose, including without limitation, in connection with, and to promote, market or advertise, the Sweepstakes, in whole or in part, without review, approval, credit or attribution, notification or payment from or to entrant or any person or entity, worldwide, in perpetuity, or on a winner’s list, if applicable. Sweepstakes is subject to all applicable U. S. federal, state and local laws and regulations. Winner will be issued an IRS 1099 tax form in the amount of the prize retail value as stated herein. WINNER’S NAME: For the name of the winner, available after 10/31/18, send a separate, self-addressed, stamped envelope to: Winner’s Name $10,000 Sweepstakes, 1716 Locust St., LS 321, Des Moines, IA 50309.